The commercial obsidian trade played an important role during Neolithic period. Its characteristics favoured the exchange network. In this way the Mediterranean area was fundamental. The availability of significant numbers of obsidian samples has allowed to improve the knowledge about the trade and commercial routes. Obsidian samples from the Mediterranean (Aegean, Flegrean, North Latium, Sicily, Sardinia) and Near East (Anatolia) areas were directly collected on the sites and considered as reference. Almost 30 elements were analyzed by Instrumental Neutron Activation Analysis (INAA). 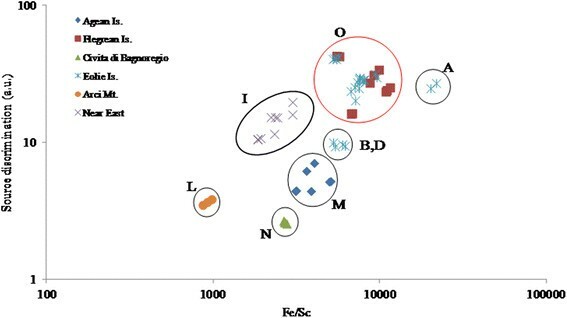 The approach based on the source discrimination analysis allowed to identify clearly different obsidian deposits, except the reference samples coming from Flegrean and Sicily areas, quite similar for their geochemical origin. The obtained data were used for assigning the provenance of 71 obsidian artefacts found during archaeological excavations in Tuscany. Two different groups were found: 16 artefacts were attributed to Sicily/Flegrean area whereas 55 items seemed to show a provenance from Aegean. The results are important because they represents a confirmation about the hypothesis of the existence of a large exchange network in the Mediterranean area since 3000 B.C. Obsidian is a volcanic glass formed as an extrusive igneous rock (SiO2 as main component ranging between 66% and 75%) that was used by Neolithic people (around 10000–3500 B.C.) as a raw material in the manufacture of stone tools such as weapons tips, knives, or other cutting tools through a sophisticated chopping elaboration. Basically, obsidian can be found in locations which have experienced rhyolitic eruptions such as the Middle East and the Mediterranean area. The trade of obsidian has played an important role in ancient times: the characteristics of good storage and processing have facilitated the trade of this stone. It must be remembered that obsidian artefacts have also been found in sites remote from supply points, confirming the importance of this raw material and spread trades during prehistoric times. Several authors have attempted to understand the role that has had this level of trade in prehistoric societies –. In this scenario, the Mediterranean area played a key role –. The largest deposits of obsidian found in this area come from the Italian islands of Lipari, Palmarola, Pantelleria and Sardinia. Briefly, some details on obsidian from these data are given below. Pantellerian obsidian, easily differentiable from the other central Mediterranean sources on a visual basis, is a Na- and Fe-rich greenish opaque stone known as Pantellerite ,. Detailed examination of prehistoric artefact assemblages has revealed at least two visual types of Lipari obsidian, one black and highly transparent, the other gray-banded, often with many spherulites present, suggesting that different obsidian outcrops might have different chemical fingerprints that would be useful for interpretation of prehistoric exploitation practices. About Sardinia deposits at least three groups (SA, SB, SC) are identified in early provenance studies on archaeological material : deposit SA is along the Southern slope of Arci Mountain, deposit SB along the Western slope and deposit SC along the Eastern slope. Such obsidians appear very glassy obsidian, variable in transparency and sometimes with phenolcrystals up to 2 mm in diameter. Obsidian of type SA is fairly translucent, glassy, similar in appearance to that of Lipari; the obsidian of type SC is opaque, less glassy, similar to obsidian from Palmarola. Until a few years ago it was not possible to define different markets for the various obsidian: this occurrence produced a great variability of obsidian and a difficult option to assign an exact provenance of an artifact from a specific area . An important example is derived from the results of a study carried out on a mosaic of the Church of St. Juvenal in Umbria (Central Italy) . In fact, the obsidian tesserae of the mosaic depicting the “Majestas Christi” in the Cathedral of Narni, come from the deposite Monte Arci, site C, in Sardinia: the peculiarity is that they have been found as reused material in such mosaic. Of course, this circumstance, very common in medieval artefacts, greatly complicates the dating of obsidian-crafted objects. If we add the existence of other smaller deposits in the Mediterranean area (e.g., Northern Latium and Campania in Italy), the ability to assign a precise provenance of obsidian in the Mediterranean is even more complicated. Moreover, important deposits are also found in the area of the Near East, from the Aegean Sea to North-East Anatolia (Kars) and Armenia (Yerevan). Obsidian coming from this area is basically characterized by the presence of feldspar phenocrystals: two types of obsidian, one black and the other olive green, are also recognized. Under a microscope analysis the latter obsidian shows needle-like iso-oriented inclusions and opaque phenocrystals . In Armenia, in particular, the existence of other obsidian outcrops is definitely known but the exact location is still unknown (e.g., obsidian raw materials collected in the districts of Kars and Erevan ). Nowadays, the ability to analyze discrete quantities of obsidian from several sites allows us to describe the market flow at the time in a more exact and precise way, even reconstructing the different mechanisms of trade and transport used in different places and periods. 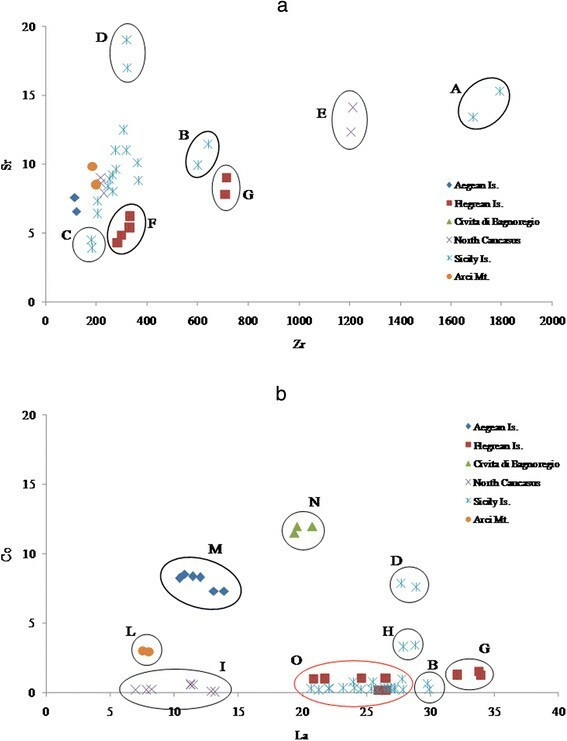 In this context, this paper focusing on the obsidian reference samples coming from different deposits of the Mediterranean and the Near East areas, identifies a possible chemical fingerprint of distinction and applies this findings to 71 obsidian artefacts found during archaeological excavations in Tuscany for assigning the relative provenance. The reference obsidian samples were directly collected in different deposits in Mediterranean and Near East areas where the obsidians were collected. In particular, obsidians of the Mediterranean area are from the Aegean Islands (Antiparos, Gyali and Milos), the Flegrean Islands (off the coast of Naples in southern Italy; Capri, Ischia, Procida Mount of Procida, Procida Punta della Lingua, Palmarola), the Campania Region (Mondragone), the Northern Latium (Civita di Bagnoregio), the Eolie Islands (Lipari, Lipari Monte Pilato, Lipari Pomiciazzo, Vivara, Vulcano), the Pantelleria Island (Pantelleria, Porta Medaglia) and the Sardinia Island (Arci Mt. ), whereas obsidians from the Near East (or Asia Minor) area are from Anatolia (Armenia, Erevan, Nemrut Dag, North Caucasus). On the other hand, 71 obsidian artefacts coming from archaeological excavations performed in Tuscany were analyzed by INAA. All the archaeological artefacts studied are dated about 5000 BP according to the not calibrated 14C investigation. Obsidian samples and standards, weighing about 0.5 g, put in nuclear-grade polyethene cylinders (Kartell, Milan, Italy), were irradiated in the rotatory rack “Lazy Susan” of the TRIGA Mark II RC-1 reactor (1 MW power) of the ENEA-Casaccia Laboratories under a neutron flux of 2.6 × 1012 n cm−2 s−1. The flux stability (>99.8%) was tested irradiating Au standards as flux monitor; the maximum irradiation temperature in the rotating rack reached 40°C. The high integrated flux, i.e. 1.8 × 1017 n cm−2, allowed to investigate elements whose γ-radioisotopes have half-life time ranging between 0.5 day and 15 years . After irradiation, γ-ray spectrometry measurements of different durations were carried out using a Ge(HP) EG&G Ortec (efficiency 23.1%,peak-Compton ratio 58.3:1, FWHM 1.70 keV at 1332 keV) connected to a multi-channel analyzer equipped with software package (Ortec ADCAM Maestro II) for γ-spectra analysis. Radionuclides characterized by gamma radioisotopes with half-life time ranging between 12 hours and 3 days, such as 24Na, 42 K, 76As, 82Br, 122Sb, 140La, 147Nd, 153Sm, 175Yb, 187 W and 239 Np, were determined performing measurements of 1 hrs-long after 5 days from the end of the irradiation; a second series of measurements (24 hrs-long) were performed after about 40 days of the end of the irradiation for determining radioisotopes with long half-life time such as 46Sc, 51Cr, 58Co, 59Fe, 60Co, 65Zn, 75Se, 86Rb, 85Sr, 86Rb, 95Zr, 113Sn, 124Sb, 131Ba, 134Cs, 141Ce, 147Nd, 152Eu, 160 Tb, 181Hf, 182Ta and 233 Pa. Overall the measurements, 30 elements were investigated: As, Ba, Br, Ce, Co, Cr, Cs, Eu, Fe, Hf, K, La, Na, Nd, Ni, Rb, Sb, Sc, Se, Sm, Sn, Sr, Ta, Tb, Th, U, W, Yb, Zn and Zr. Table 1 shows the nuclear data and Limits of Detection (LODs) about the radioisotopes considered in this study . Nuclear data (i.e., radioisotope from (n,γ) reaction, half-life (h: hour; d: day; y: year), peak energy, note) and LOD of each element investigated in this study (a: calculated according to ref. 15 and expressed as μg g-1; b: interfering radionuclide; c: other types of neutron reactions). Before performing analyses, the gamma detector was calibrated. In particular, energy and efficiency calibrations were obtained by means of calibrated sources such as multi-gamma radioisotopes, MRL1654 and MRL1655, from National Metrology Institute of Ionizing Radiations (INMRI, Italy), and single-gamma radioisotope, 152Eu, from Comité a l’Energie Atomique (CEA, France). For INAA analysis, primary and secondary standards were irradiated and measured in the same conditions described above. A mixture (ranging between 10–200 μg of single element; each solution was obtained by dilution from 1 mg mL−1 of mother solution of each one) of primary standards (Carlo Erba, Milan, Italy) was used. On the other hand, secondary standards were USGS GRX-4 (i.e., rock) and USGS G-2 (i.e., granite) (United States Geochemical Survey). The uncertainty of the methodology was tested measuring the secondary standards with solution of primary standards at different concentrations; the repeatability of measurements on obsidian matrix was tested by analyzing seven times, at different cooling times and with different measurement times, an obsidian sample coming from the Procida deposit. Finally, interferences due to the formation of radioisotopes measured as fission products (95Zr, 6.50%; 134Cs, 0.028%; 140La, 6.30%; 141Ce, 5.78%; 147Nd, 2.30%; 153Sm, 0.27%), have been evaluated and subtracted irradiating pure primary uranium standards. Among various possible analytical methods for the characterization of minor elements in obsidian, we have chosen a nuclear analytical technique known as Instrumental Neutron Activation Analysis (INAA). This technique allows to both analyze a very large number of elements (theoretically almost 70 natural elements of the Periodic Table; more realistically about 40 elements) with very good limits of detection (LODs), sensitivity and accuracy –. About the precision and accuracy of measurements performed on the standard involved in this study, all the found data for the standards are in agreement with the certified values. Table 2 shows the comparison between the determined concentrations and certified concentrations for the USGS GRX-4 and G-2 standards . As it can be seen, the difference between the two data-set is good for almost all elements . The accuracy can be considered satisfactory, being for most elements in the range of ± 10% of the reference values; a good precision has also been obtained in most cases. Analytical comparison (mean ± s.d. ; μg g−1, except% for Fe and K) of USGS GRX-4 standard. In brackets are reported the coefficients of variation, CVs (%), calculated as ratio between standard deviation and mean value × 100. An important point of this study was to evaluate the applicability of the nuclear analytical method to obsidian samples. In this way, an obsidian sample collected in an Italian deposit (i.e. Procida Mt. in Gulf of Naples) was subjected to neutron irradiation: seven γ-spectrometry measurements were carried out at different cooling times and with different measurement times for determining the repeatability of the measurements in such matrix. Table 3 shows the results obtained for this task. As it can be seen, the CV% is always below 10%: in particular, it ranges between 0.7% (Ce and U) and 5.3% (Sb) for almost all the elements except As (8.5%), Co (8.1%) and Cr (8.6%). This understanding allows us to consider the whole analytical procedure used to be effective for the study of artefacts made of obsidian and coming from different deposits. In fact, the main elements to be taken in consideration for right assignment of the obsidian artefact provenance, is based on the content levels of some elements difficult to be determined (e.g., the source discrimination equation requires levels of Sc, Cs, Ta, Rb, Th, La, Ce). Mean value (μg g−1), standard deviation, minimum and maximum values (μg g-1) along with the Coefficient of Variation (CV%) obtained analyzing the same obsidian sample (deposit in Procida Mt. in Gulf of Naples) by means of 7 γ-spectrometry measures. Mean element levels along maximum and minimum values of obsidian collected in different well-defined deposits and analyzed by INAA (μg g−1, except Fe, K and K expressed as%). Identification of obsidian sub-deposits from which the samples used as reference were collected. Bi-plots (1a: Zr vs Sr; 1b: La vs Co) of the element grouping showing the sub-deposits (A: Sicily Is. Balata dei Turchi; B: Sicily Is. Vivara; C: Sicily Is. Porta Medaglia; D: Sicily Is. Incaldana; E: Near East Nemrut Dag; F: Flegrean Is. Capri, Ischia and Monte di Procida; G: Flegrean Is. Procida Punta Lingua; H: Sicily Is. Arivito; I: North Caucasus; L: Arci Mt. ; M: Aegean Is. ; N: Civita di Bagnoregio; O: Flegrean Is. and Sicily Is.). Figure 2 shows the relative plot: all the deposits are almost well-separated (i.e. North Caucasus, Arci Mt., Civita di Bagnoregio, Aegean Is., 2 deposits in Sicily), whereas the samples coming from both the Flegrean Is. and some deposits from Sicily show the same pattern. This last analysis based on the trace element data determined with high accuracy and precision (due to the nuclear analytical technique used), allows us to assign the area of influence to each obsidian sample. As it can be seen, the obsidians coming the Near East are different from the obsidians coming from the Mediterranean area whereas obsidians from this area is not easy to differentiate. In particular, even if obsidians from Arci Mt., Civita di Bagnoregio (North Latium, Italy) and Aegean Is., make well-defined clusters, it cannot say the same thing for the Sicily and Flegrean obsidians. This suggests some other considerations about the ores in those areas: the two areas, i.e. the Flegrean area located in region Campania (South Italy) and the Sicily, are geochemically quite similar  whereas obsidians from North Latium (Avino P, Capannesi G, Rosada A, Manigrasso M: Classification of an area as metallogenic province: environmental importance and problems, submitted, 2014) and Sardinia (Arci Mt.) are totally different, confirming as reported in literature. Source discrimination vs. Fe/Sc plot of reference obsidian sample. Multiple regression analysis: plot of the discrimination factor vs. Fe/Sc abundance ratio of the obsidian samples collected directly on the deposits and considered as reference in this study. 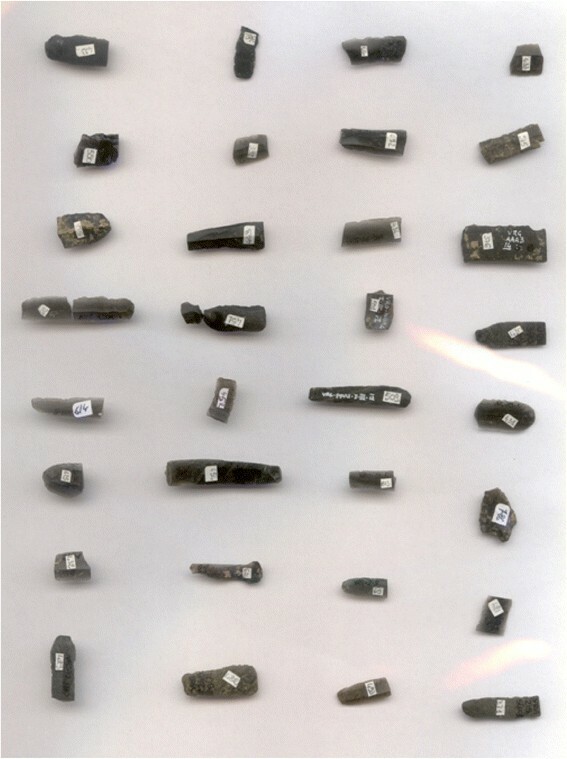 Figure 3 shows examples of the 71 obsidian artefacts coming from the archaeological excavations performed in Tuscany. Table 5 shows the trace element data (column “all data”) for all the artefacts investigated. Basically, the overall variability of the elements (expressed as CV%) ranges between 11% (Hf) and 166% (Sb) (average 53%), except for 7.5% (Zn), i.e. 1 of 31 elements show a significant variability whereas in the obsidian samples collected directly on site 8 of 27 elements (such as Sr, Ta Th, U, W, Yb, Zn, Zr) report a CV% below 10%. According these data our hypothesis was of obsidian artefacts from different provenance, so we decided to apply the source discrimination approach to these samples using the previous obsidian samples as reference. The elements Ce, Cs, La, Rb, Sc, Ta and Th, are sufficient to separate the obsidian artefacts in different groups with high probability: Figure 4 shows the source discrimination approach applied to all the data. Two different groups (#1 and #2) can be well-recognized and divided according the sub-deposits previously identified. The samples owning to group #1 (16 samples) are attributed to Sicily or Flegrean Is. provenance whereas the samples of group #2 (55 samples) are definitely attributed to Agean Is. provenance. Theoretically, these considerations would be prudentially drawn and subjected to large uncertainty. Of course, the use of statistical methods similar to those involved in provenance characterization and quality control of the goods, increases the quality and gives high assurance on the results obtained. In this case, the availability of reference samples investigated and analyzed in the same conditions, allows us to extrapolate almost certain considerations on provenance of the obsidian artefacts found in the archaeological excavation. Formal obsidian tools from a site in Tuscany (3000 B.C.) Some obsidian artefacts found during archaeological excavations in Tuscany (Italy). The artefacts date back to 3000 B.C. according to the 14C investigation. 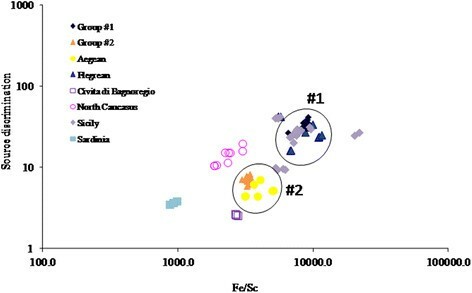 Element content (μg g−1, except Fe, K and K expressed as%) of obsidian artefacts (classified as group #1 and group #2) collected during archaeological excavations in Tuscany and analyzed by INAA. Source discrimination vs. Fe/Sc plot of obsidian artefacts. Multiple regression analysis: plot of the discrimination factor vs. Fe/Sc abundance ratio of the obsidian artefacts found during archaeological excavations in Tuscany. This understatement confirms previous hypotheses  about the presence of a large network of exchange between the Aegean and the Mediterranean in the Third Millennium B.C., a period of significant developments and rapid progress throughout the Mediterranean (and Aegean particularly). The archaeologists define the directionality of exchanges in terms of the presence or absence of objects from one area to the other. Our attention is pointed out on the 55 samples (group #2) coming from Aegean area. In fact, it is almost understandable the presence of obsidian artefacts (group #1) from Sicily/Flegrean areas whereas it is quite interesting the presence of obsidian artefacts made by material coming from East Mediterranean area (also considering the large availability of such substance in Italy). But, the distribution of imported objects and the influences in the Near East and Italy suggests that both networks were unidirectional and directed towards the Aegean. To the West contacts seem to have been unidirectional: from the Aegean to Italy, Sicily and Sardinia. The network consisted of exchange of material goods with the East and those exchanges relied either on freelance trade of ivory and, presumably, perishable goods, or random exchange of prestige gifts . The availability of reference samples in heritage studies is quite important. Further, the obsidian reference items are important for a better knowledge of the exchange routes during the Neolithic period. The archaeologists consider importance of exchange as a factor of civilization growth. This study gives evidences about the large exchange network in the 3000 B.C. : even if Italy shows large deposits of obsidian in different areas, artefacts made by obsidian from the Aegean area and dated 5000 BP have been found in Tuscany, meaning the existence of a flow of goods towards one or the other direction in the Mediterranean are (from East to Western, and vice versa). From an archaeological point of view, it is still uncertain whether the objects were directly or indirectly received from their place of origin and we always need to view the overall picture by distinguishing among areas with different distributions of imported objects. In this way, the availability of reference obsidian samples from more areas as possible, is fundamental for both the reconstruction of the commercial trade and the knowledge of the artefact provenance. The authors are grateful to Dr. Nicoletta Volante (University of Siena) for having furnished the obsidian artefacts from Tuscany archaeological excavations and Dr. Francesco Guidi-Giolj (ENEA) for having collected the reference obsidian samples. This work was supported under the grant INAIL/ DIPIA/P20L01, 2013–2015. PA coordinated the study. PA and AR set up and performed the analytical procedure by means of INAA. PA and AR edited the text and prepared the final draft of the paper. Both authors have read and approved the final manuscript.